After mailing my absentee ballot, some reflection has left me totally confused as to how someone might still be undecided. With such stark differences between the candidates, it’s hard for me to imagine a state of mind that would result in being an undecided voter. Luckily, it doesn’t seem like we need to wait to find out on what side of the bed some undecided Ohioans wake up Nov. 4. In case there’s an undecided voter out there who is going to choose based on the opinions pages of the NYT, WashPo, New Yorker, etc (I find it unlikely that there are many undecideds in the audiences of these papers) their editors have come out with their (un)surprising endorsements of Barack. But endorsement season doesn’t stop with the elite, liberal, America-hating media. Any loyal HuffPo reader has surely seen endorsements that range from poor attempts at humor to last minute ship jumping. I don’t want to entirely minimize the importance of endorsements. Obama’s commanding lead (133-44 among print media) around the country should end the “discussion” about the sufficiency of his experience. I’d also be lying to suggest that I haven’t been following the endorsements closely. The last few weeks have seen some really moving, strongly worded statements of support laden with political and historical significance beyond the immediate choice. Colin Powell’s forceful eloquence on Meet The Press should reassure even conservative voters as to Obama’s capacity to keep the nation safe. I was particularly impressed with his denouncement of the McCain/Palin/Right Wing attacks; I believe his argument was only stengthened by the obvious insanity of his post-endorsement skewering by racist right wing zealots. Though nothing can ever atone for Powell’s infamous argument for war at the UN, he’s using his immense credibility with the American people for a cause this time. It’s a start. how do you say "schlep" in wasp? Today one of The Times‘ election blogs has an interesting post on viral design for the Obama campaign. Shepard Fairey’s designs have emerged as some of the most recognizable images of the two-year-long campaign, providing the visual style for a small industry of copycat productions. The culture gap between the two campaigns – in both meat- and cyber-space – is a result of the pro-Obama movement’s natural tap into the reservoir of decentralized production. When the most lively (i.e. youthful) pro-McCain online space is a production of the candidate’s own daughter, the right can hardly expect to keep up with the enthusiasm of a savvy, left-leaning generation’s first authentic political identification. Not to take any credit from the geniuses behind the campaign’s sensational success, but the most memorable bits of campaign material came from fans, not staffers. Obama has certainly had to fight many kinds of cross-cutting prejudice in this election and the campaign has worked extraordinarily hard to familiarize the nation with That One. Last weekend, I saw a particularly jarring piece of campaign lit (that of course was produced by a state party and is not endorsed by any candidate or candidate’s committee) making this argument. 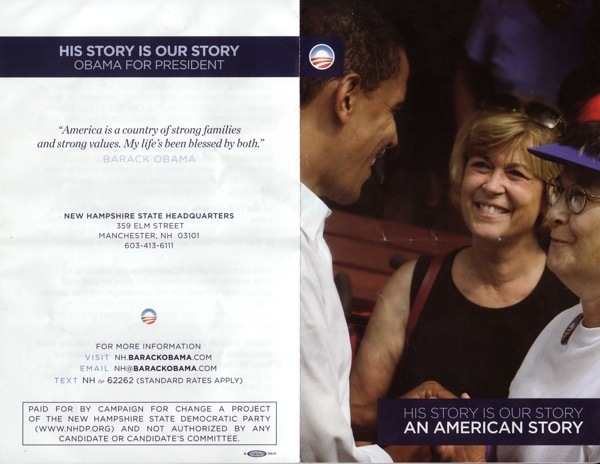 I know that this story can’t be told enough both for the cause of electoral success and to help guarantee Obama’s safety beyond the election, but I am quite glad that I didn’t have to stick that in Nashua’s doorjams. It’s straightlaced message is as easily distinguished as the lines in that white grandmother’s face. It’s definitely the northern New England version of Sarah Silverman’s Great Schlep PSA. I might be generationally biased, but I think the viral video is better. Since i’ve never lived in a battleground state, American politics really feels like an internet phenomenon followed from afar. Saturday, I got my first taste of democracy in( )action: canvassing for Obama (and Shaheen and Hodes, but I’ll get to those two in a minute) in Nashua NH. Between the too-early wake up (6.45) and the many folding tables covered in big box store brand rugelach and boxed coffee, I could tell I was in for a treat. The Obama regional office in Nashua is located along a strip of fast food joints in a low-slung former mattress showroom, which may have fallen victim to the economic slowdown. Volunteers from Little Rhody (including over ninety from Brown), Massachusetts, and Connecticut joined local folks in tight shivering circles sipping apple cider and learning how to use the demographic information in our walk packs. There was enough campaign lit to educate thousands on the need for A New Direction in Washington and enough campaign stickers for people to put them on both the inside and the outside of their jackets. The impressive variety of local campaign posters in the windows – mixed in with handwritten oak tag signs – and the circulating Shaheen volunteers in green hoodies gave the scene a real small town feeling. We were assigned to canvass Westgate Village, a charming development southwest of town. The McCain-Palin lawn sign outside our first house, 2 Boulder Circle, made it perhaps the easiest of the day. Zack and I were novice canvassers, so when we got to our next target, Birdy took the lead to show us how it was done. Unfortunately, the middle-aged Republican man who answered the door was not pleased when she asked for someone who lives down the street. It was the first door closed on us, but we coded it as a “not home.” They’ll get another visit later this week. It was clear that the people in the neighborhood were wise to our little canvassing scheme. The first person to actually talk to us we caught on the way into his house with some groceries. We were at the house next door, and it was clear he was trying to sneak in without being noticed. He (re)informed the campaign, through us, that he is an Obama supporter. It was his fifth time being canvassed this week. Most of the doors we knocked never opened. Most of the driveways were empty, but it definitely felt as if the people of Nashua know not to open their doors late on saturday mornings. One of the most shocking (and encouraging) aspects of the trip was a real look at how the Obama campaign is overwhelming McCain on the ground. While knocking on several doors, we noticed old Obama “lit” on the stoop. Since we were dropping the same glossy pamphlets, it had probably only been a couple days since the last canvass. But we never saw any vestiges of the McCain campaign; no canvassers, no lit, and only two lawn signs (including a particularly repulsive and contextually ineffectual “Another Democrat for McCain”). We “talked” to several McCain supporters (“you have the wrong house, kids”) but it seemed as if the McCain campaign has given up on a state that is historically red and only recently turned purple. Back at HQ after an edible Boston Market lunch we joined a little parking lot rally. John Kerry got up on the bed of a green pickup (i forgot to check whether or not it was a domestic model) and gave a rousing little speech about how he thinks McCain is a great guy but would be a terrible president (all i could think of was Jason Sudeikis’ Biden impression from the SNL VP debate). It was great to wave the Obama sign and snap a grainy cell phone picture while cheering at the same talking points we used hours earlier. I was especially impressed by Kerry’s self-effacing discussion of McCain’s flip-flopping combined with a slight jab at himself. Before yesterday, I had never been to a political rally, never canvassed a battleground state, and never felt as close to American democracy. It was definitely worth missing a few hours of sleep. is amazon just lucky or is this a little scary? Though I’m aware that i’ve leveraged my privacy online in unintentional ways for benefits like internet shopping suggestions, I like to think that at least my information is dispursed. In many ways influenced by the internet classic EPIC 2014, which anticipates a future of the internet (from the position of ~2004) dominated by Googlezon’s “GoogleGrid,” my view is that this tactic of diversification prevents crime of opportunity-esque aggregation. I know that i’ve put a lot out there that someone could bring together to construct a profile relatively easily, but I am willing to hedge with the bet that avoiding populating any one cloud too much is just enough to preserve some incoherence in my cyberspace identity. Last night, I was looking for some new sneakers online with some friends. I spent most of my time on an apparently low-budget site and spent about half an hour surfing around. But I never visited Amazon. I’ve never shopped for shoes on Amazon. I can’t remember ever even stopping by their clothing section(s). 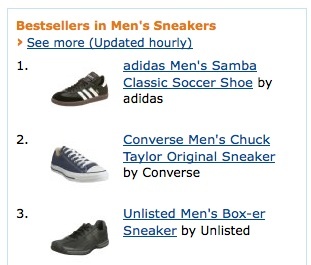 Now I’m sure that sneakers are probably a pretty popular category online, so it may just be a coincidence. But juxtaposed against what else they’re trying to sell me – e.g. For Marx and Einstein’s Ideas and Opinions – it’s quite unsettling. Sarah Palin’s “discussion” with Katie Couric should be shocking for anyone with a brain. The content of the interview itself is of little critical interest – there’s no need for any commentary beyond what’s offered in this week’s New Yorker cover. "Look what I can see!" What I do find interesting is the way the interview has been handled. CBS News clearly understood the power of what they had in the can and it certainly would have made a splash regardless of how it was released. Recall that ABC aired Palin’s first interview, with Charlie Gibson, in a couple long segments. This produced two real days of new news and youtube clips for horrified voters to distribute via email. CBS apparently took this tactic even farther; each day since the Couric interview, there has been a new question with a frightening “answer” that makes it to the top of political blogs and email inboxes. Every day, the country gets a new dose of Palin’s foolishness. The McCain campaign must be quite frustrated having to fight this viral video in every news cycle. What worries me is the reception these displays of ignorance. It’s obvious that Palin is stuttering and losing her train of thought (to be generous). But if the viewer is just as ignorant as she, how offensive will her political illiteracy be? It’s a lot easier for a stupid gaffe to make waves than it is for a verbal vacuum to outrage people. Now we just need that to come out of Tom Brokaw’s mouth.